"This was not a decision we took lightly," chief executive Peter Fankhauser said as he announced the new policy. In a blog post, he acknowledged that both parks had met standards and had made improvements to how animals were kept. But, he said: "From next summer, we will no longer sell any animal attractions that keep orcas in captivity. "We have actively engaged with a range of animal welfare specialists in the last 18 months, and taken account of the scientific evidence they have provided. "We have also taken feedback from our customers, more than 90% of whom told us that it was important that their holiday company takes animal welfare seriously. "And when so many of our customers are so clear in their view, I could not allow our business to ignore them," Mr Fankhauser said. "I am clear about the kind of business that we want to be. That's why we introduced our animal welfare policy 18 months ago, and that's why we've taken this decision today." 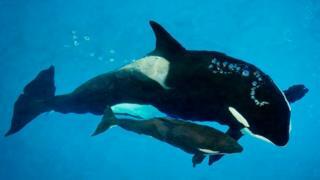 SeaWorld said it no longer bred killer whales, but the ones it already had "will be with us and our visitors for many years". It said "millions of UK guests" had visited its parks and that it would continue to "welcome the public" to them. "They have seen first-hand the incredible care we provide all of our animals and learned about how we are protecting and saving species in the wild," it said in a statement. Criticism of keeping orcas in captivity has intensified since a 2013 Netflix documentary Blackfish about a performing killer whale called Tilikum. SeaWorld's visitor numbers fell, although the theme park described Blackfish as "manipulative". Last year, Thomas Cook began an audit of 49 animal parks to see if they met its policy on animal welfare, based on standards set by ABTA (the Association of British Travel Agents). Some 29 failed, and the travel firm stopped selling tickets. The latest ban was announced on Sunday. Mr Fankhauser said: "We will work with both [theme parks] over the next 12 months to prepare for our exit.... We will also continue to work ourselves to identify more sustainable alternatives." Why is SeaWorld changing its whale shows?